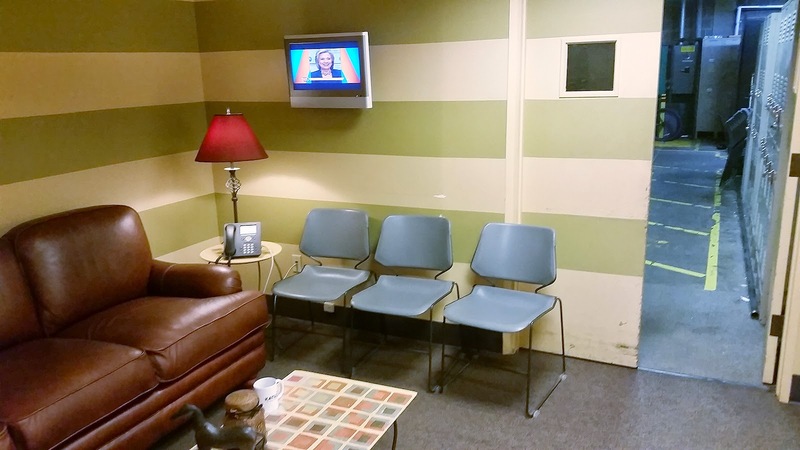 So delighted to have a new installment of Off the Shelf for you today! 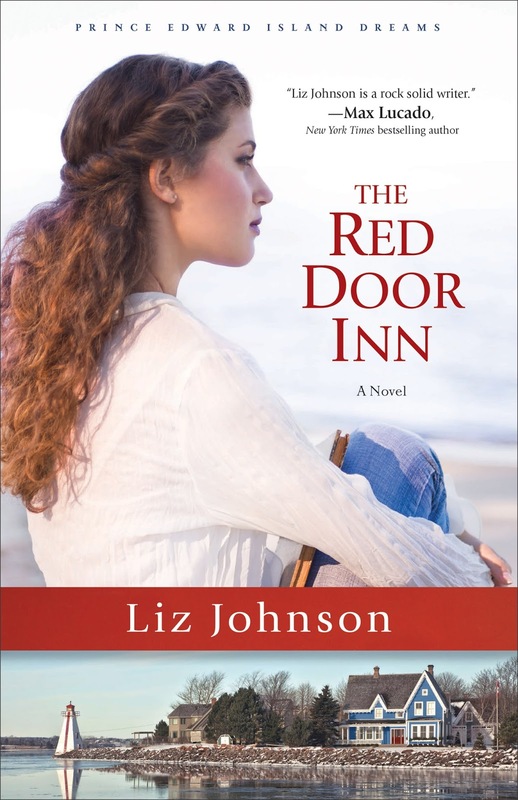 Liz Johnson, author of The Red Door Inn, is stopping by today to share about her favorite book, The Guernsey Literary and Potato Peel Pie Society. 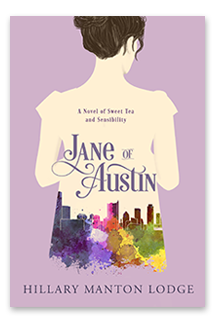 It's a novel that's been on my re-read list for quite some time, and Liz's blog is an eloquent reminder why. A little over a year ago, I met the new girl at work. She was outgoing, funny, and loved books—maybe, almost as much as I do. We hit it off right away, and I knew we could be good friends. And then we hit a bump in the road. During one of our countless book discussions, she confessed. 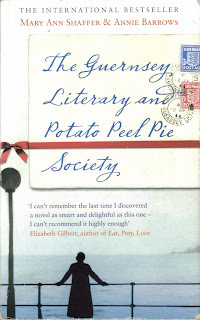 She’d never read The Guernsey Literary and Potato Peel Pie Society by Annie Barrows and Mary Ann Shaffer. I repeat—a self-professed book lover had never read the most enchanting book of all time. She hadn’t even picked it up. (Of course, if she had picked it up, she absolutely would have finished it, because how could you not finish such an endearing book?) I wasn’t sure this budding friendship could withstand such a hiccup. The Potato Peel Pie book, as I affectionately call it, is the book that I recommend to everyone I meet. I had the very good fortune of working for the publisher when the book was released in paperback, and I managed to end up with a hardcover and three paperbacks. And I’m proud that I’ve given away half of those. But I always like to keep at least two on hand. One to share and one because I never know when I’m going to feel the urge to curl up with it and a hot cup of chocolate on a cool winter night. So, what is it about this book that’s so special, you ask? I’m glad you did. First, it’s told entirely through letters. We’re first introduced to our heroine Juliet, as she’s corresponding with friends while hunting for the topic of her next book. She’s a writer, so I love her already. And the epistolary format allows us to hear the unique voices of each character—including the ones we’d rather not hear from at all. 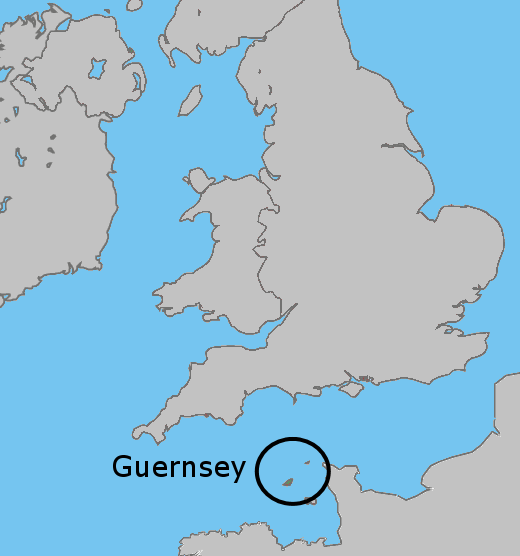 It’s 1946 when she receives a fan letter from the tiny island of Guernsey, one of two English islands that were occupied by the Germans during WWII. Which leads us to the second reason this is such a special book. There are plenty of books out there about WWII, but this one looks at the war and the plight of people stuck in terrible situations from a whole new angle. The good people of Guernsey and the members of the aforementioned literary society share with Juliet stories of their beloved friend Elizabeth and the terrible toll the war has taken on them all. But also the hope that they discovered in the midst of the occupation. That hope brings us to reason number three why I love this book so. Hope allows the book to be absolutely enchanting. Even in the midst of tears, I was so in love with the people who pepper the town. I was so beyond delighted with their joys and broken by their sorrows that I felt I knew them. Felt I belonged with them just as much as Juliet does. Fourth, and finally, through it all blossoms the sweetest romance, one that had this particular reader cheering out loud in an airport upon my first reading. But the love story isn’t only between Juliet and her man. It’s also between the wild and witty cast of characters who find their way into the reader’s heart, who share life and love and loss and somehow bring it all back to hope. 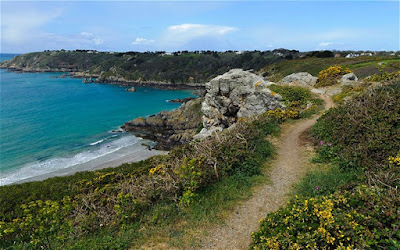 Isle of Guernsey - read more here. In the end, I think the book says it best itself. “Perhaps there is some sort of secret homing instinct in books that brings them to their perfect readers.” I count it as my duty to make sure this book finds its way into the hands of as many perfect readers as possible. And I’m pleased to report that my friend took my suggestion, borrowed my book, and read the Potato Peel Pie book. And she was just as enchanted as I am. Friendship saved. 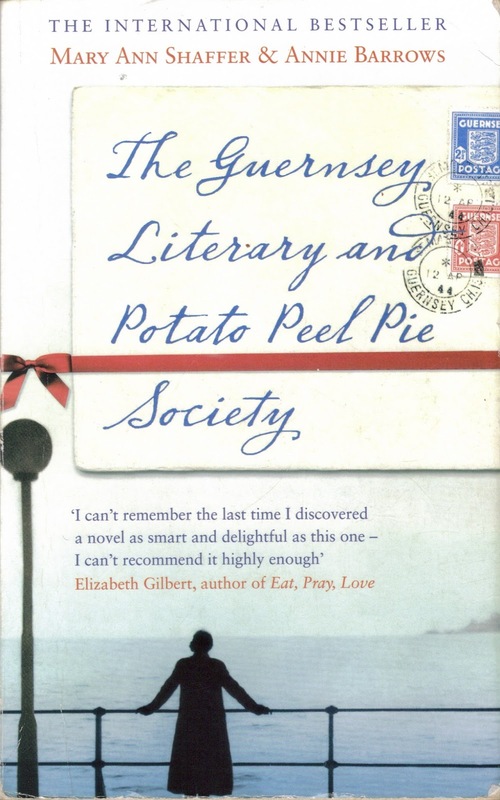 Have you read The Guernsey Literary and Potato Peel Pie Society? How enchanting did you find it on a scale of one to dancing in the rain? 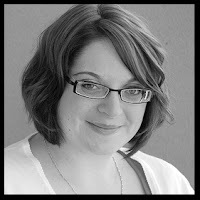 About Liz: By day Liz Johnson works as a marketing manager, and she makes time to write late at night. Liz is the author of nine novels—including her first contemporary romance, The Red Door Inn (Prince Edward Island Dreams, book 1)—and a New York Times bestselling novella. She makes her home in Nashville, where she enjoys exploring local music, theater, and making frequent trips to Arizona to dote on her nieces and nephews. 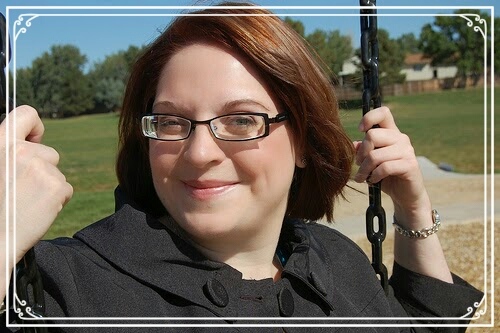 She writes stories of true love filled with heart, humor, and happily ever afters. Connect with her at her website and Facebook page. 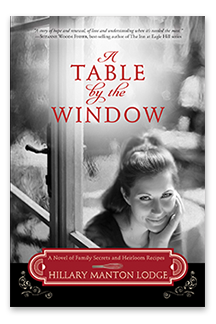 About The Red Door Inn: Marie Carrington is broke, desperate, and hoping to find sanctuary on Prince Edward Island while decorating a renovated bed-and-breakfast. Seth Sloane moved three thousand miles to help restore his uncle's Victorian B and B--and to forget about the fiancée who broke his heart. He wasn't expecting to have to babysit a woman with a taste for expensive antiques and a bewildering habit of jumping every time he brushes past her. 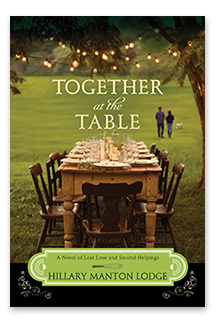 The only thing Marie and Seth agree on is that getting the Red Door Inn ready to open in just two months will take everything they've got—and they have to find a way to work together. In the process, they may find something infinitely sweeter than they ever imagined on this island of dreams. We're giving away a copy of The Red Door Inn! Log in and comment below to enter. Tell us - if you could go to any setting of a fictional book, from PEI to Merryton, where would you visit? I love,love, love this book and recommend it all the time! Recently re-read for the third time and look forward to many more. It's just so lovely! I love the way the romance unfolds. I would love to visit PEI. I grew up near the Texas Gulf Coast and enjoy the ocean. PEI is on my list of places I'd love to go, too! I guess I would have to choose Farthering Place in Hampshire, England. This is the home of Drew Farthering in Julianna Deering's series. It's difficult to choose a place in a fiction novel that's not associated with the people there. 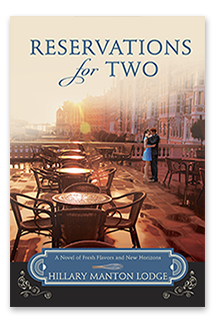 Galveston Island in Janice Thompson's Weddings by Bella series and Mitford in Jan Karon's series would be wonderful places to visit with a condition. I would have to be there at the same time as the book characters. Yes, I could go to Galveston and enjoy it, but it would be more fun if the Rossi family was there and I got to work along side them in their wedding business and pizza place. The same goes for Mitford. I would love to return to Blowing Rock (town on which Mitford is loosely based), but it would make my heart sing if it really was Mitford and all the shops and book characters were there from the series. The Red Door Inn sound fantastic, Liz. I'm looking forward to reading it. Oh my gosh, I was just coming here to leave a comment and saw your Drew Farthering comment and got all giddy. I'm reading that series right now and looooove it to death. So I'm totally going to steal your answer. Farthering Place! I'd go to Farthering Place! I have **really** got to read Julianna's series - I keep hearing such great things about it! I would LOVE to go to Scotland and see Eliean Donan Castle, ever since I read Highland Passage by J.L. Jarvis. I googled it - it's so gorgeous! What a great pick! If I could go to any setting from a book...oh who am I kidding? I don't need to think long on this one. Concord, MA in the 1860's where the March girls lived. Forever my favorite book, Little Women. Red Door Inn looks fantastic--adding to my To Be Read list for sure! I would love to visit Lancaster, PA. Thanks for the giveaway. You're welcome, Donna, thanks for stopping by! Great pick! Thanks for commenting, Sarah! I love the tease above and was looking for more to read. Would love to win this. Has a great story line. It really does! I highly recommend. I would like to visit Mitford! I've never read the Potato Peel book, but I can tell you my mother loved it! I think if you like Mitford, Potato Peel is right up your alley. A little darker because of the war, in a couple places, but overall extremely cozy. I am so excited to read this book!! Thanks for stopping by, Becca! Can't really say there is one place I would want to visit. There are just too many choices. I agree, it's hard to pick! Saskatoon because my pen pal lives there!! It's so good! I really think you'll enjoy Red Door Inn. My dad gave me a whole set of Anne of Green Gables books, one at a time on birthdays and Christmas. I fell in love with Anne and where she came from, PEI. That's where I'd love to go! Thanks for reawakening my love of Potato Peel Society! And good luck on the new book. What a sweet gift from your Dad! Thanks for stopping by, Sherrey! Someday I would like to visit PEI I just haven't had the privilege yet... This looks like an interesting read - whoever designed the cover did a fabulous job!